The Cerulean Jewels are the most sought after gemstones in the Universe and are jealously guarded by those who are fortunate enough to possess them, coveted by those who do not. One such collection, the largest in existence, is situated in a cave somewhere in the Caribbean and guarded by the fiercest and most fearsome of gemstone owners anywhere, the Black Widow. Many a man has perished trying to wrest the stones from her grasp, and many more will for she has the formidable power of a Jaramian wormhole at her beckon call to destroy anyone who dares venture into the cave... while others are lulled into a false sense of security when she beckons them to suckle on her breast, which is as venomous as her lethal bite. IconPackage... Alien 2005 (recoloured) by Yangge. DX Objects.... Wormhole by Jaramia... Candles by Richard Mosely. ObjectDock.... Leopard Tiles (transparent) by TNBrat... icons, Spiderlike available at DA. 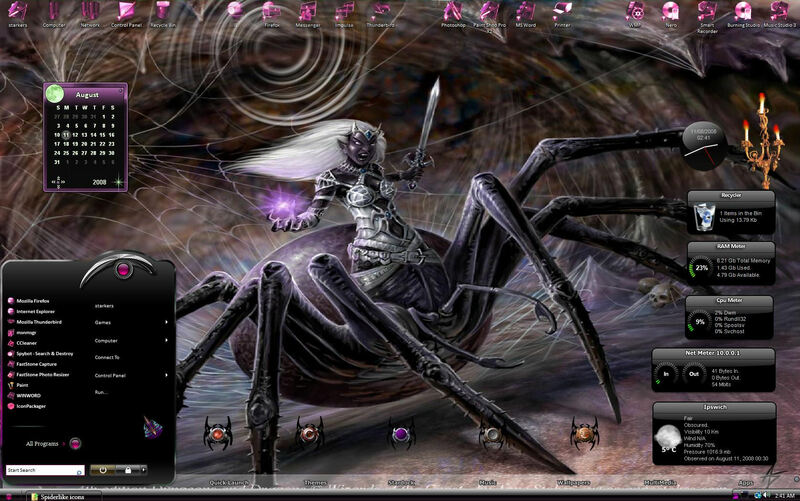 Wallpaper..... Drider by Ironshod, aka Anne Stokes. Thanks go to all the skinners and artists whose works made this shot possible. Oh, and for you guys who think she's hot... like the preying mantis, she eats her lovers afterwards. Hehe. Starkers,what a creative screenie. I had forgotten what a beautiful skin Boxxi had created in the Cerulean Jewels but you really brought it out. I love the recoloring job on the IP. Great job!!! Yeah, I'm quite proud of this shot cos of how everything blends so well with Cerulean Jewels... it took a bit of manipulating to get just right, but the end result was well worth it. Anyhow, I'm glad you like it and thanks for stopping to comment. I know they are looking for honeys for the new series of Baywatch, she'd look good in red and they would only need one of her for the whole of South Beach, plus whoever she saves she can eat thus creating more openings in the extras market, can she swim do you know. ... thanks guys, you're a great bunch of people and I really appreciate your support here.